Are you one with kale? Now you can be more than ever. 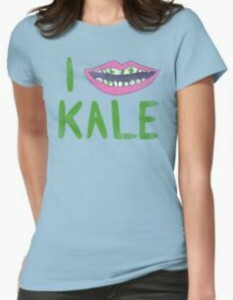 This kale in my teeth t-shirt is sure to find a way into your regular t-shirt rotation. One simple graphic is all it takes to turn some heads on the street. This might be just the one you have been looking for. It starts with an “I”, right beside the I is a large mouth with teeth, and in between those teeth are piece of kale. Under both the I and mouth is a big “KALE”. Over 16 colors are available for this quirky t-shirt. Colors like orange, berry and eggplant are sure to catch the eye of a fellow kale eater. The women’s t-shirt sizes range from Small to 2XL and the logo can be printed on the front or the back of the t-shirt. The t-shirt comes in a slim fit and is made of 100% cotton.